Little House Home Arts: Another Free Give- Away Drawing--Register to Win Now! Another Free Give- Away Drawing--Register to Win Now! It is already November and time for another free Common-Thread Artist to be featured who will give away a sample of her artwork. Kim Gifford is our Artist for November and will be giving away a package of eight note cards featuring her artwork. 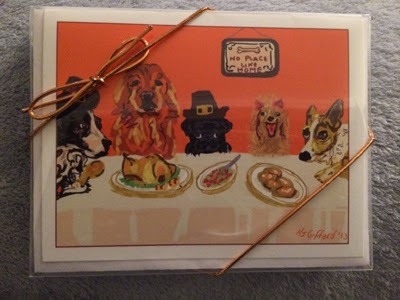 These blank notecards are perfect for wishing those you love a wonderful Thanksgiving holiday! To know Kim is to know that she is a fun-loving, sensitive and deeply spiritual person who is kind and loving to her family, her pugs and her friends. Her joy for life is reflective in all of her work. Do check out her website at Pugs and Pics. For those who know Kim and have experienced her artwork before, you may be as surprised as I was as to see how her artwork continues to evolve. Kim's big news is that she has a show that is exclusively featuring her work at the Radio Bean in Burlington, Vermont November 7th through December 3rd! Her exhibit is entitled Once and Future Things and is a study on girlhood, in the form of her digital collage art which incorporates different mediums and textures to create one-of-a-kind artwork unique to Kim. Don't forget to register to win her cards by simply leaving a comment along with your name, now through Wednesday and perhaps you will be the lucky winner of this month's Common-Thread Give-Away Drawing held at the end of this week. For those that are new to our group's free monthly give-away, know that this is our way of thanking you for visiting our Common Thread Give-Away Artist's websites. You will find them and the links to their websites listed on the right hand side of my blog. To visit them, simply click on their names and don't forget that we do this every first Monday of the month! Our group is in process of expanding and we are excited to bring you new and diverse artists and their work very soon, so do keep checking our websites and good luck on winning these great cards!